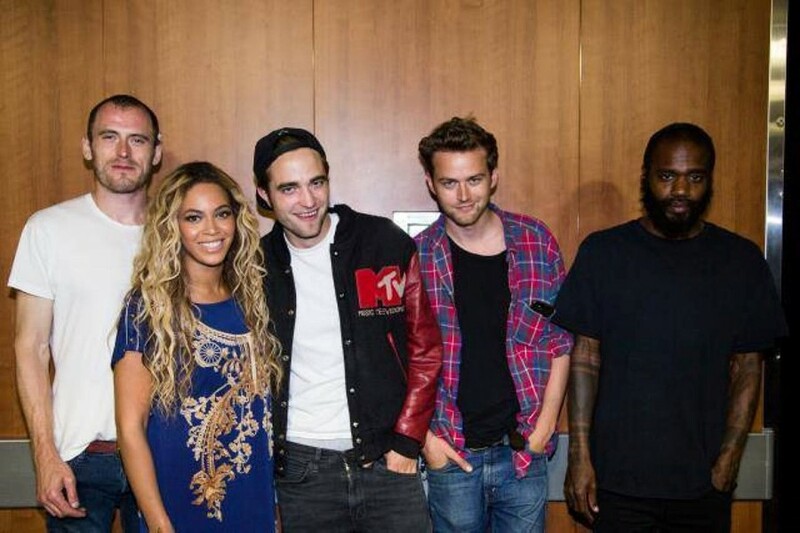 Last year, Robert Pattinson was snapped alongside Death Grips and Beyoncé in possibly the weirdest group photo in showbiz. Were Death Grips getting into acting? Soundtracking a Twilight sequel? Writing songs with Bey? This weekend, an observant Redditor shed some light on the situation by spotting a credit for one "Rob Pattinson" in the vinyl liner notes for "Birds", a track off the third Death Grips album Government Plates. Apparently drummer Zach Hill recorded Pattinson playing guitar on his iPhone and then sampled it for the track. Government Plates was released in November 13 last year as a free download with 900 copies of the record released on vinyl for Record Store Day on November 28. Death Grips announced their split earlier this year, but you can console yourself by listening to "Birds" featuring R-Pattz below.